Received my copy of the glo Bible, and I will supply notes as I go about installing and using it. Program starts right up, and indeed I do get the option to "Explore Glo Now!" or to "Continue installing Glo media" which will take 1-3 hours. I'm going exploring! Here's the opening screen. 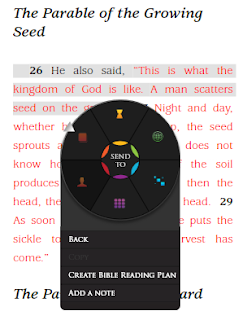 These are the "lenses" that provide the overall orientation: Bible, Timeline, Atlas, Topical, Media, and MyGlo. Nice. Most things work via a drag and move. (If my computer had a touch screen, this would be very easy to navigate.) The scroll wheel will magnify/decrease display when appropriate. Moving the mouse over any section pops up more options: changing text size, navigation buttons, changing from mouse navigation to text selection, popout links back to main menu, page snapshot, search, bookmark the page, etc. I note that I have the NIV translation (the only other option for now is KJV) with NIV Study Notes at the bottom. Clicking on the study notes or photo brings up another page like this with articles, photos, artwork, virtual tours, maps, and interactive documents that are attached to this passage. Articles are from the Zondervan Pictorial Encyclopedia of the Bible. My spot can be saved as a "session" at any time to return to it. Looks like I will need to take the time to load up the rest of the content to do much more. So I will come back to this later. 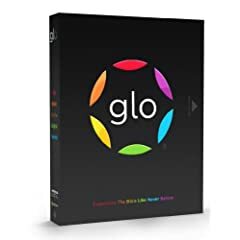 I read a lot of mixed reports about the program on glo's Amazon page, but, other than the minor glitchy things with installation, I'm not experiencing any problems. My system certainly isn't state of the art, and I am using an external hard drive. (I can understand the desire to get fast access to media by requiring hard drive installation, but still, 18GB is a lot of space...) The text display is fast. The other graphical stuff is not 'fast,' but at a few seconds for the visuals to appear, it's certainly acceptable. 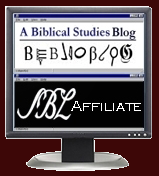 While the program won't be confused with a heavy duty Bible software package for original language study, it is a diverting and entertaining way to get around. I suspect that many users will start out with a text and end up wandering around from some interesting aspect to the next. I suspect this is the kind of thing most casual readers are hoping from a Bible software package, so I am (at this point) comfortable recommending it. I'd like other options than the NIV or KJV, but I suspect that was a natural marketing decision based on what Bibles are best sellers today. The 1975 Zondervan Pictorial Encyclopedia of the Bible (which sells for $125) is not my favorite, but it's better than the public domain dictionaries floating around the web or included in other software packages. Selling for about $50, the glo Bible is not that much more than a bound study Bible. You certainly are getting a value when you consider the reference and media materials included in the package. I'll finish my report later after loading the rest of the media and playing with it a bit more. The most exciting part about glo to me is the metadate (e.g. who was speaking, where, when, etc.). They can keep the fancy user interface. Give me a simple way to search that data and I am happy. 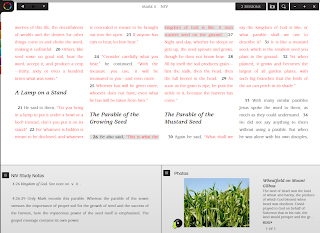 Glo Bible is by design oriented around folks who prefer viewing images and media rather than actually reading. 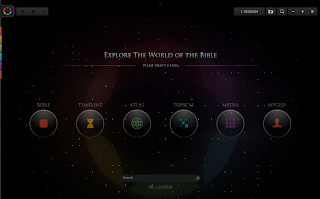 Glo assumes you want to answer questions about life and find what the Bible says on the subject (which is OK) but you are subjected to the designer being in between you and the raw data of Bible information on a topic. Glo is billed as a “find anything you want” kind of tool, when in reality it is a “find what we think you will want to see” kind of tool. Decisions about what is shown seem to be the personal preferences of the designers rather than an appeal to biblical scholarship and the historic church. In the topic of Marriage, you will find the subject of Post-partem depression. This has never been identified as a subject the Bible discusses. Yet the designers of Glo felt it would be a question they and you would ask, so it’s included and with verses that (no surprise) don’t address this subject at all. Of course, you can always use the Bible pathway in a global search. But there, the results are not terribly useful, since they are presented in a completely random, unorganized manner (you won’t see love references in I John grouped together). To open verses by book, you are stuck browsing the Scripture results by trying to find references to a book among scores and sometimes hundreds of unorganized hits. So in general, students need to accept the fact that Glo can’t be used as a concordance-style search tool in any efficiently useful meaning of the term.